Like so many others a butterfly nursery theme can blend nicely into other nursery themes based on nature. Start by painting a nursery wall mural featuring a clear blue sky. Include a crisp white picket garden fence and some other friendly bugs such as ladybugs and dragonflies. I will share some decorating tips and tricks that will save you lots of money and time as well as pictures of nursery designs where butterflies are featured in many different styles and color schemes. You will find ideas and shopping resources for the items you need to decorate a butterfly theme room for a baby girl or boy. So collect your favorite butterfly pictures and ideas for your baby butterflies decor and let's get started. In addition to the essentials found in every nursery; other items with a butterfly motif might include rugs in the shape of a butterfly or wall hangings that will make the space cheerful and a comfortable place for your baby to play. There are many colors here to work from in creating your butterfly nursery theme. Your baby girl's decor will be filled with cheerful butterflies! In most modern butterfly nursery bedding sets there are bold color schemes with lots of hot pink, lime green, royal purple, sky blue and bright yellow. Pink and Brown Butterfly Nursery with custom window treatments. 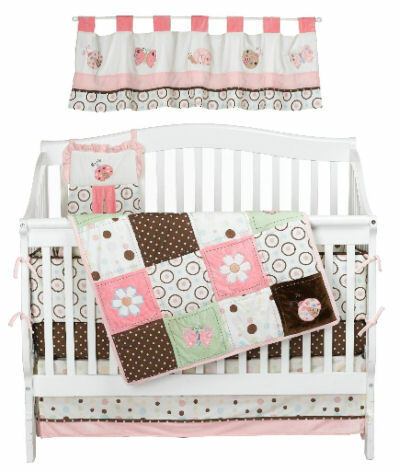 If you prefer a patchwork quilt embroidered with appliques in a butterfly motif, this is the perfect baby nursery! You can use not only butterflies, but colorful flowers and other little bugs as well! There are ladybugs and even a hive full of honey with some cute yellow and black bumble bees buzzing about. 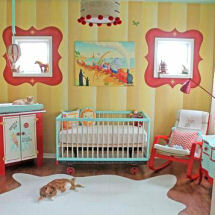 Babies rooms decorated with dragonflies and butterflies are really trendy! Look at all the fabulous pictures of baby rooms decorated in a butterfly nursery theme in the new magazines out this season. Use the colors in your butterfly crib bedding to locate the best colors that will pull your unique nursery decorating ideas for your baby girl's rooms together in a professional manner. Carry your baby nursery bedding with butterflies that have been printed or appliqued on the comforter with you to the paint store for a basic blueprint as to how to set up your butterfly baby decor successfully! Butterflies are so versatile and finding the perfect set of butterfly baby bedding is a moment to treasure! There are just so many great butterfly decorations that you can use to accessorize your butterfly nursery theme. Here's a way to pick up some inexpensive decorations for decorating with butterflies. Check out your local garden center for some cheap butterfly themed items! When you no longer want baby rooms covered in butterflies, you can recycle them to decorate the patio or porch. Return to find more decorations for your butterfly nursery theme and lots of baby nursery ideas featuring tips for how to choose your butterfly bedding and decorations to create wonderful a wonderful room for your infant.